God of War II closed by setting the stage for what could be one of the most epic games of all time: As Zeus delivered a confident speech to assure the Gods that they would easily wipe out the "plague" that was Kratos, the ground shook underneath them. They ran to look down the side of Mount Olympus and saw Kratos and the Titans staring back up at them. Sure enough, that's exactly where God of War III picks up, never stopping until there is simply nothing left to destroy. The Ghost of Sparta's vengeance is finally complete, but it wasn't exactly what I had expected and I came away feeling somewhat unfulfilled. After playing through it a few more times and giving it more thought, I can finally articulate why that is. 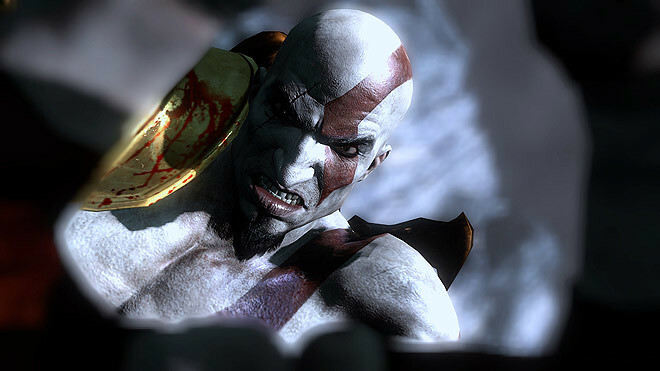 After a brief, very stylized introduction reminiscent of the James Bond movies to sum up the events of the first two installments in the trilogy, the game's title screen sets Kratos' face against a world thrown into complete chaos. An angry sky cracks and shifts as lightning flashes, tornadoes rip through the ground below, the rain beats down and locusts pervade the air. Press start and Kratos will say, "My vengeance ends now," before everything flashes back to the end of God of War II. As the camera pans up Mount Olympus, following the Titans' ascent, Zeus gives a rousing, eloquent speech to the other Gods detailing how the rise of Olympus brought order from chaos and is now being challenged by the mortal, Kratos. Zeus vows to "wipe out this plague" and the Gods confidently stride over to watch the Titans climb. The contrast between Zeus and Kratos is obvious once the perspective shifts. Kratos is not a man defined by words, but through violence. He delivers one quick line before handing off control to the player, instead choosing to express himself through mass murder. These two men could not be more different. However, it's apparent that God of War III's introduction, while mostly faithful to God of War II's ending cutscene, has made subtle, but significant changes to the tone of these early events. At the end of II, Zeus' speech carried a much stronger air of arrogance and ended with the walls beginning to crumble around him, visible evidence of Kratos' challenge to Olympus. The other Gods had to jump over and dodge falling debris to reach their vantage point over the Titans. But in III, no walls crumble and the Gods are able to walk with poise and composure. These are minor differences by themselves but represent Stig Asmussen's different direction for the series. Asmussen has gone to greater lengths than previous game directors David Jaffe and Cory Barlog to portray the Gods as at least somewhat just and vilify Kratos. Over the trilogy's arc, Kratos has been making a slow transition from a sympathetic antihero to a villain with daddy issues. Asmussen smartly illustrates the monster Kratos has become, consumed by revenge, through Kratos' early, grisly murder of Poseidon. When the player presses the familiar circle button prompt as Kratos stands over the bloodied, broken water god, the perspective shifts to Poseidon's point of view as Kratos brutally beats him, kicking him while he's down, slamming his head into rocks, and throwing him aside. We watch from Poseidon's eyes as he coughs up blood and tries to crawl away until Kratos picks him up and punctures those eyes with his thumbs. It's a gut-wrenching moment that makes you realize that there aren't any heroes left in the series. Kratos is much less sympathetic than before, and while the Gods are portrayed much more favorably in this entry, showing them on the defensive and fighting for order against Kratos' unrelenting chaos, they are still far from heroic. I don't think it's been an entirely fair transition, though. Kratos used to be a flawed character whose actions were at least understandable, even when they clearly crossed all sorts of moral and ethical boundaries. In III, Kratos still has legitimate grievances and reasons to kill Zeus, but those reasons fall by the wayside in the narrative, opting instead for blind rage, making it harder to identify with his quest than it should be. One of the biggest failures of God of War III is letting players lose sight of why Kratos is fighting in the first place. God of War III's introduction wasn't just impressive; it was a remarkable step forward for the series, representing an evolution in seamless level design that flowed from one incredible scripted moment to another with ease. But it was also paced uncharacteristically badly. 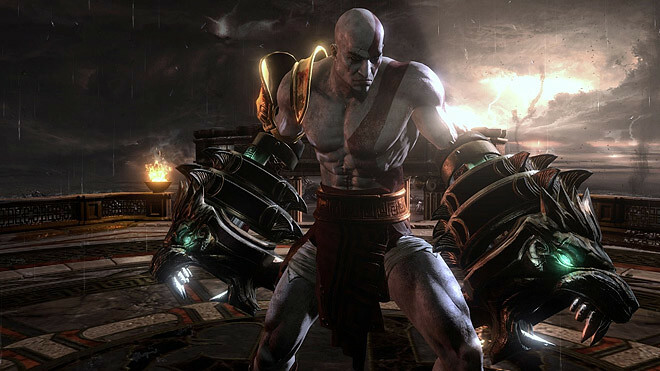 By allowing Kratos to reach Zeus in the first 45 minutes, the game had nowhere to go but down. The first meeting with Zeus goes exceptionally, predictably poorly for Kratos. After a heated exchange where Kratos exhibits classic Greek hubris, Zeus fires a single bolt of lightning that sends Kratos and Gaia tumbling back down the mountain. Kratos struggles to hold on to Gaia, demanding that she help him. Gaia refuses, telling Kratos that they'd both fall if she tried to help him. She says that he's just been a pawn this whole time and lets him fall. Kratos lands in the River Styx, is stripped of all his powers, and you're back playing another by-the-book God of War game. After such a fantastic opening sequence, it felt like Sony Santa Monica was eager to get back to its established formula and put the rest of the game on autopilot. To be realistic, we knew that the fragile alliance between Kratos and the Titans would have to shatter, but it was a mistake to rush that plot point with such a weak, unconvincing betrayal. There was nothing Gaia could do to help Kratos; she could barely keep herself from falling. After she played such a pivotal role in helping Kratos in God of War II, such a quick, frail double-cross doesn't really make sense and comes across as cheap and rushed. It felt like a cop-out. When Sony Santa Monica realized that the game they had set up at the end of God of War II could only really be about four to five hours long, they had to find ways to stretch it out. Of course, the easiest way is simply to repeat the beginning of II: Kratos is betrayed and killed by someone he thought was helping him, sent to the Underworld, and loses all his powers, sending him on an eight-hour quest for revenge. Let's get something straight here: This is the third time that Kratos has been killed and sent to the Underworld in this trilogy. Making things exponentially worse is Athena's return once he crawls out of the River Styx. Kratos accidentally killed her at the end of II, but she's back anyway as a ghost. Or something. Regardless, the reunion cutscene between the two is melodramatic and poorly acted on both sides. Kratos turns away from her like a cheesy soap opera star and spouts awkward lines like, "Be quick with your words," and Athena's new voice actress saps all the personality from a once-great character. Athena's presence in God of War III is like an anchor from start to finish. She adds nothing to the story but needless complication; for instance, after Kratos' blades presumably get corrupted in Styx, she immediately replaces them with much weaker blades to earn his trust. But how are weak blades supposed to convince Kratos that he can trust her? Clearly though, Kratos didn't share my concerns. Athena tells Kratos that to kill Zeus, he'll need to find Pandora's Box again. This is troubling not just because this is the second time Athena has sent Kratos on a quest to kill a god using Pandora's Box, but because Athena's motivations are extremely suspect. She gave her life at the end of God of War II to stop Kratos from killing Zeus, determined to protect Olympus and end the cycle of son killing father. Once you reach the end of the game, you realize that Athena's true motivations had been to use Kratos to reopen Pandora's Box so that she could retrieve the power of hope that she had stored in there long ago. What she didn't know was that, after Kratos opened the box in God of War, he inherited the power of hope while the rest of the Gods were infected by the evils that had been locked away. This twist changes how we have to view every God of War game released so far other than Chains of Olympus, which is set years before Kratos was ever tasked with opening Pandora's Box in the first game. So rather than maintain the sublime, almost poetic opening of God of War II, which forced Zeus to kill his son, Kratos, for the exact same reasons he had tasked Kratos to kill his other son, Ares, in the first game, Asmussen chose to retroactively change these events to propose that Zeus had simply gone insane with paranoia, a result of the infection Kratos had released. Once again, he attempts to cast the Gods as victims. The implications of this twist are more far-reaching than Asmussen probably anticipated. From the moment Athena told Kratos to find Pandora's Box near the beginning of God of War, she doomed everyone. As the Goddess of Wisdom, Athena should've known better. She should've told Zeus long ago that Ares was only on a warpath because he desperately sought his father's approval. But that's just it. In his attempt to put his own stamp on the God of War legacy and deliver a memorable ending to the trilogy, Asmussen opened his own Pandora's Box. Now we are forced to reevaluate David Jaffe and Cory Barlog's work. Whether or not they approved of that twist, it directly affects how we play their games. Once Athena realizes that Kratos has the power of hope within him, she demands it from him. Kratos instead chooses to kill himself, releasing hope to the world. Athena has the last line in the trilogy, telling a dying Kratos that she is disappointed in him. Kratos manages to sputter out a chuckle before collapsing. Athena's radical shift in behavior in God of War III could be attributed to a possible infection of any greed released from Pandora's Box, but why did it take until after her death for that infection to manifest? No, if Athena had actually been infected with greed, she wouldn't have sacrificed herself to save Zeus at the end of II. She would've seen that as an opportunity to take over Olympus. Simply put, all Asmussen does with his insane twist is create plot holes in the series. Not much really noteworthy of real criticism happens during the middle sections of the game, besides raising questions about why Pandora was never seen in God of War, the first time Kratos embarked on a quest for Pandora's Box. Why wait until the box is empty to guard it with the Flame of Olympus? Really, Pandora's role in the game is as unnecessary as Athena's. I simply don't believe that Kratos would be willing to jeopardize his revenge on Zeus simply because this girl he just met kind of looks like his daughter, Calliope. Asmussen's big play to humanize Kratos falls flat on its face when we remember that Kratos is the guy who burned an innocent man alive just to open a door in the first game. Kratos has no reason to care about Pandora, and neither do we. But God of War III is an action game through and through, so the most interesting parts of the story are at the beginning and the end. And it's with the ending that Asmussen gets especially bold. The inevitable conclusion to the trilogy had to be a fight with Zeus; that much was obvious. The first round of this fight was absolutely incredible to watch and play, a 2D-plane match reminiscent of the silhouette fight against the last Spartan in God of War II. The second round is also a play on God of War II, starting off in a circular arena lined with columns, just like the final fight with Zeus with II. Asmussen flexes the PS3's muscles by interrupting that fight with Gaia's massive hand slamming down in the middle, forcing both men to leap inside her to end it all. Kratos ends up stabbing the Blade of Olympus that Zeus used to end the Great War right through Zeus' torso and into Gaia's heart, killing both at once. Zeus has one more trick up his sleeve and manages to come back and knock Kratos out, triggering one of the weirdest, most unexpected segments imaginable. Kratos falls into darkness and relives some of his greatest regrets, like the deaths of his family and Athena. Pandora helps guide him along through this darkness until eventually Kratos finally forgives himself. He comes back to kill Zeus in a first-person sequence similar to the murder of his family. Then he pummels Zeus with his fists until the screen is literally covered with blood for just a little too long, creating an awkward moment where I didn't really know what to do. Athena shows up, pieces everything together, and demands the power of hope back from Kratos, who responds by plunging the Blade of Olympus through his torso. The camera zooms out while Kratos bleeds on the ground. After the credits, the camera zooms back in and all that's left is the Blade and a blood trail leading off the cliff. So what does this mean for the franchise? Will every subsequent game be a prequel, or will we see the ideas from the special features of God of War play out? A game based on the modern day military finding Pandora's Temple chained to the bones of Cronos could be interesting, but it would have to be radically different from anything else in the franchise. In fact, a simliar game already exists in Legendary, a first-person shooter set in a New York City ravaged by mythical beasts after Pandora's Box is opened. But really, is Kratos even dead? The smart money would be on "yes," but you never know. If Kratos is dead and returns to the Underworld for good, he could face up to his brother, who was killed when they were children in the traditional Spartan ritual of abandoning the weak, despite Kratos' best efforts. That idea was also introduced in the first game's special features and has yet to be explored. Regardless of what happens next, we do know that this is a big deviation from the series creator David Jaffe's original plan, which was a smooth transition from Greek mythology to Norse mythology until Kratos becomes Death himself, explaining why these mythologies have all died out. So despite being the most fun game in the trilogy, it also ranks as the weakest overall. Asmussen clearly had some interesting things to contribute to Kratos' story, but ultimately, he created several glaring plot holes and ended up with a story not nearly as strong as David Jaffe or Cory Barlog's.